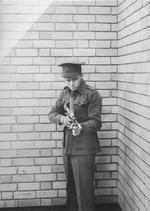 ww2dbaseIn July 1939, a few months before war broke out in Europe, 24 year old Evelyn Owen presented, at Victoria Barracks in Sydney, his design for a .22 caliber submachine gun that could be manufactured out of parts from a .22 caliber rifle. Despite war on the horizon, upon closer inspection Ordinance Officers informed Owen that the weapon would not be accepted by the army, as it was .22 caliber. Owen told them his design could easily be adapted to suit any caliber. What they failed to mention was that they had discounted submachine guns as the British army had not adopted weapons of this type in previous wars. However, the terrain of Europe meant firepower could be easily transported to support the British army in the field. Artillery and tanks could not easily be moved to support Australian troops in the jungles of New Guinea, what firepower the troops needed, they carried, so Owen’s gun was ideal. The Lysaghts steelworks at Port Kembla began manufacturing the Owen gun in 1941. By 1945, 50,000 units had been produced. Unlike other submachine guns, like the American Thompson or British Sten, the Owen had a top loading magazine, ideal for jungle fighting, as it kept the magazine free of mud to clog the mechanism. It was tough, and stoppages were rare. Besides the Second World War, it saw service during the Korean War and Vietnam War.